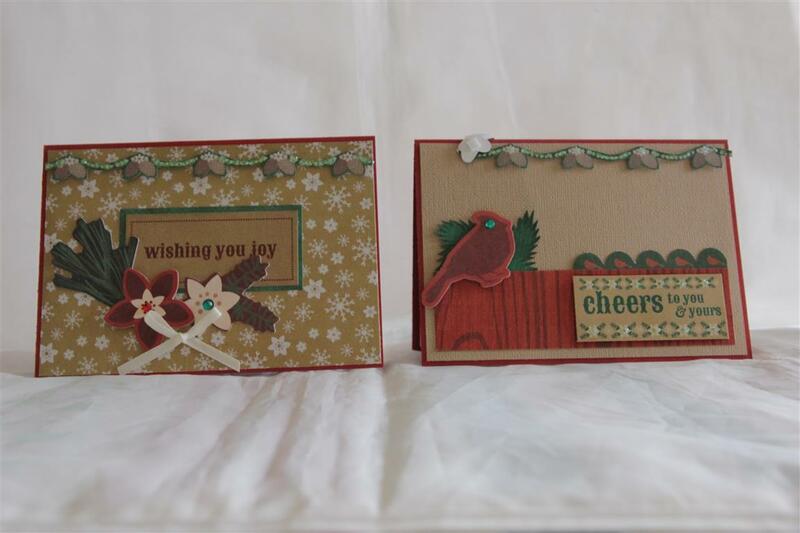 An early post today – These cards were made with primarily Stampin Up products. I have searched everywhere for my catalogue so that I could tell you the name of the designer paper, but to no avail, so will find out from my sister and edit this post at a later date to give you that info. 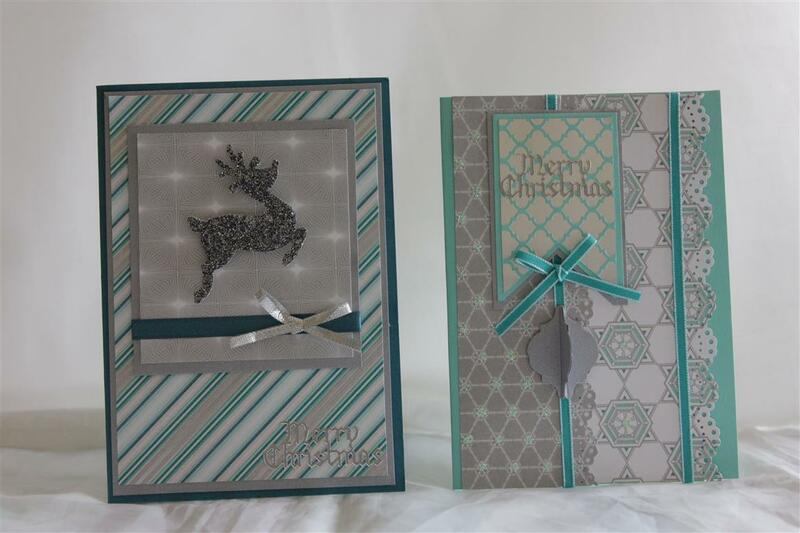 * One of my followers – Kay has let me know that the stampin up designer paper is called Winter Frost.Lovely set of papers in this collection!Thank You kay. The cardstock is also stampin up, and I used the stampin up mosaic punch to punch out my bauble shapes.I punched them out of glitter cardstock. The colours I used here make a nice change from green and red for christmas don’t you think?Til tomorrow…. This is the last of my holly Bright paper collection. I have made an amazing amount of cards with this paper, but it’s time to move on! 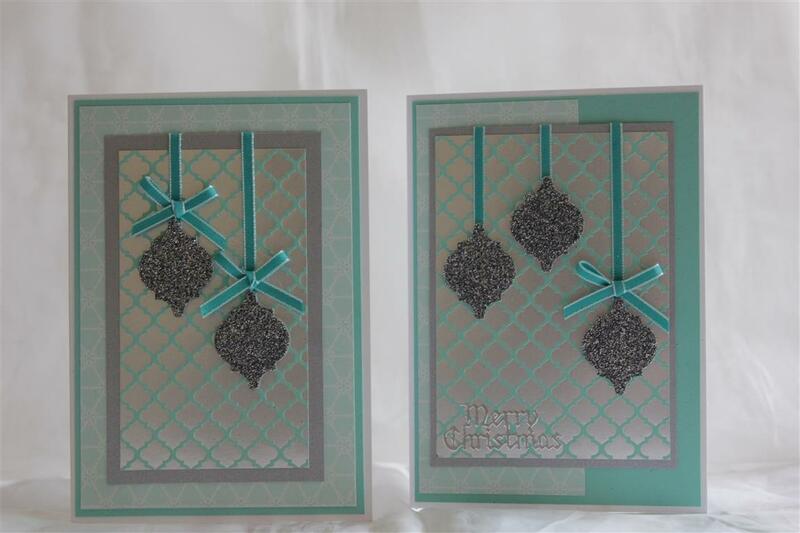 I used the 6″ pad for these two cards, and some Kraft and stampin up cardstock. I also used some of the collectables, and the greetings were from a 12 x 12 sheet.Ribbon and bling added the finishing touches.today has been all about housework, but i am about to head into the craft room to do some creating! til tomorrow…. 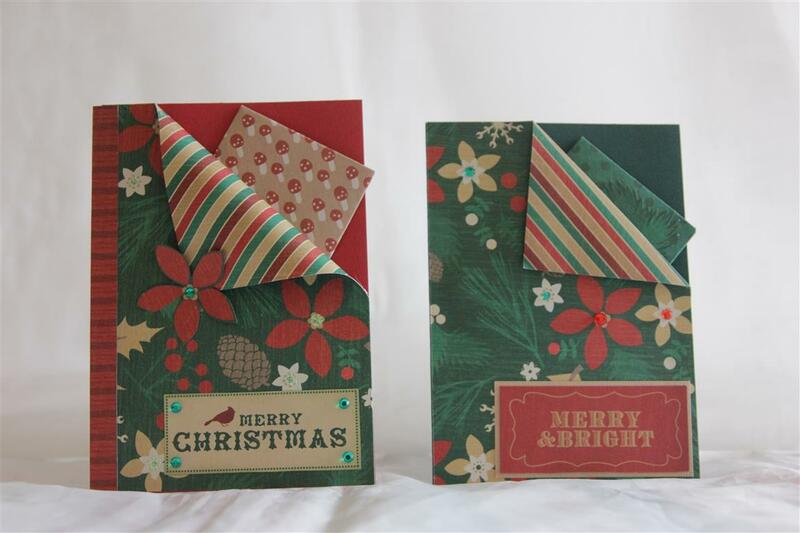 A bit of everything from the Holly Bright collection on these two cards – the background papers are from the 6″ pad, the greetings from the sheet of 12 x12 paper, and some collectables thrown in. I added some xmas type flowers and ribbon and bling to finish. The cardstock is from stampin up.Today i have been making bright summery cards, when I should be having a last push at the christmas cards, but christmas still seems a bit far away to me for some reason this year – I think it’s because I still have a couple of birthdays before then and I can’t think seriously about christmas until they are past….til tomorrow…. 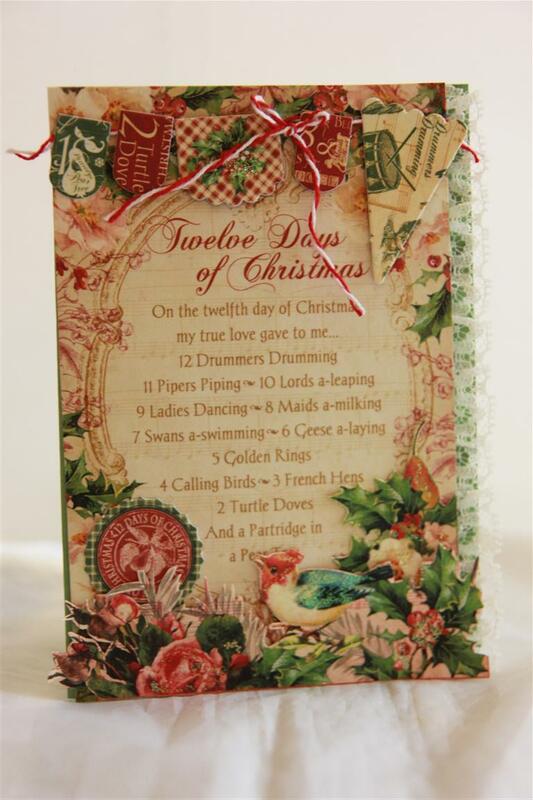 Number 11 in my Kaisercraft Holly bright paper series, and here I have used the 12 x 12 papers. the bird is from the collectables, and I just added a little ribbon bow and some kindyglitz to finish. So glad the working week is over for me – I have struggled this week with this coughy coldy thing,and hopefully a couple of days at home will knock it on the head once and for all! Til tomorrow…. 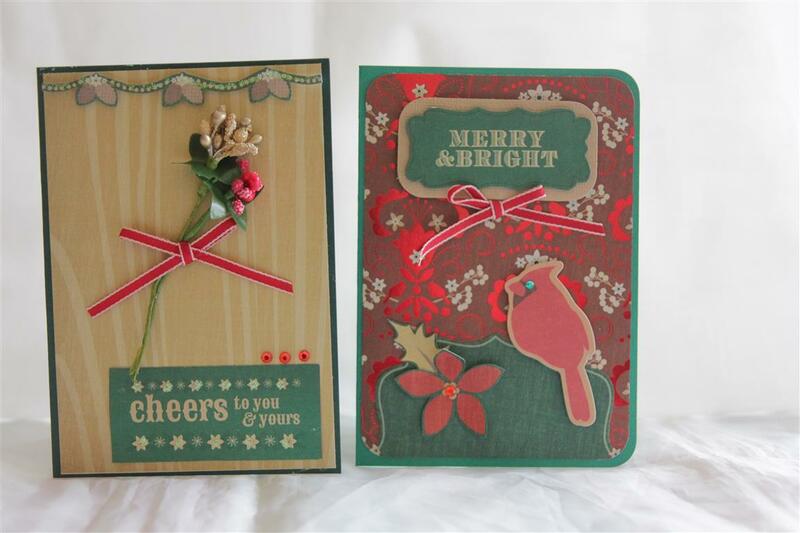 Todays cards were made with Kaisercraft Holly Bright papers. I made these ones with the idea that you could enclose a gift voucher in them, so the front layer is peeled back and I used my Memory Keepers envelope maker to make a small envelope – I used the smallest size on the board for this.the greetings were cut out from a sheet of matching paper – this sheet is brilliant – it has 36 greeting on it so great value.The cards didn’t need any more in the way of decoration so I just added a little bling. Here it is, the last in my graphic 45 12 days of christmas series. 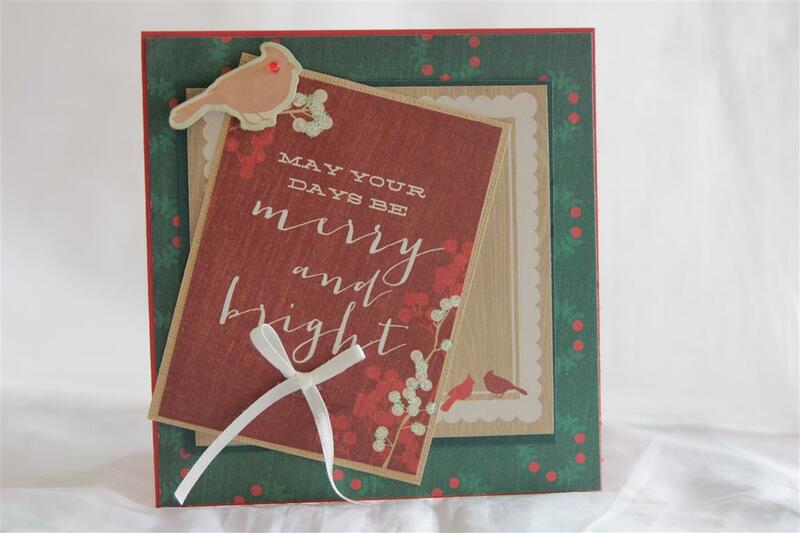 I think I have combined everything on this one – layering, fussy cutting, lace and chipboard pieces.I have loved using this paper, still have some left, but today I have been working on more christmas cards using up my kaisercraft paper. I must concentrate on using up some older papers, as I have run out of room to buy more so there may be some posts where we revisit some old favourites! Til tomorrow….